Young children who have been prescribed orthotics for flat feet will eventually outgrow them if they were prescribed before bone maturation in the foot has occurred. In boys that continues till the mid-teens. For girls that process stops a year or so earlier. Bone maturation means that unless a significant structural change occurs in the treated foot, the orthotic may be used for at least 5 years or until signs of breakdown occur. How is bone maturation diagnosed? The easiest way is by plain radiographs in the office. The doctor will examine the radiographs and look for consolidation of the growth plates. These growth plates look like a break in the bone. When the separation disappears it signifies that the bone had reached a mature state and will no longer grow lengthwise. 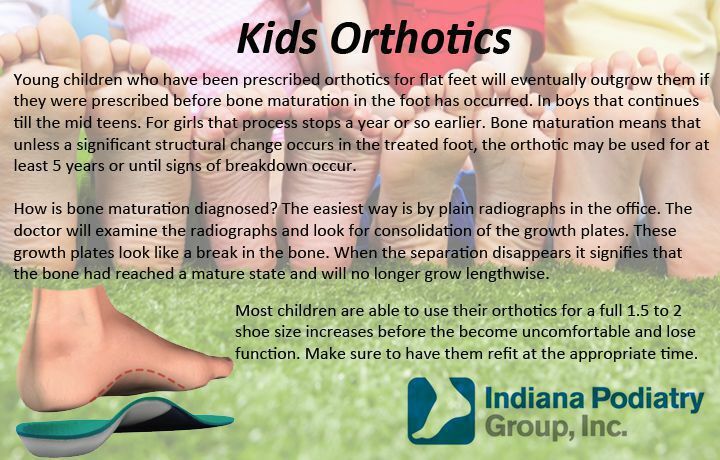 Most children are able to use their orthotics for a full 1.5 to 2 shoe size increases before they become uncomfortable and lose function. Make sure to have them refit at the appropriate time.